On October 24, 2018, I was watching Bloomberg TV and listened to the phone interview with Fortum CEO - Pekka Lundmark. As Finland and Scandinavia is a pretty familiar region to me (I spent about a year studying in Finland, back in 2006/2007) - I decided to explore more. 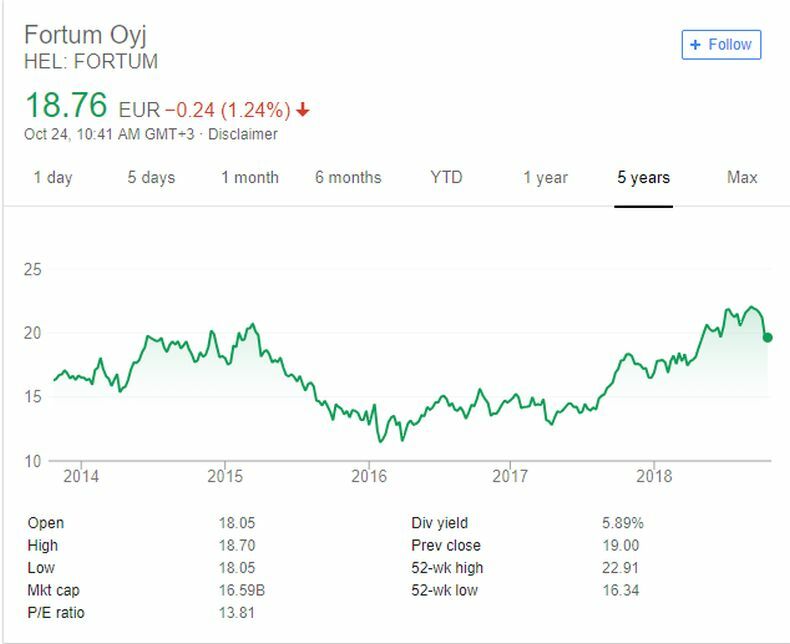 Fortum Oyj is an energy company focusing on the Nordic and Baltic countries, Poland, Russia, and India. Fortum operates power plants, including co-generation plants, and generates and sells electricity and heat. In addition, Fortum provides waste services such as recycling, reutilisation, final disposal solutions and soil remediation and environmental constructions services. The company also provides other energy-related services and products e.g. expert services for power plants and electric vehicle charging. Fortum is listed on the NASDAQ OMX Helsinki stock exchange and shares the number one position in the Carbon Disclosure Project's (CDP) Nordic climate index. I'm not saying 100% that I will actually buy this stock, I'm saying Fortum looks at least interesting to me. There are two things that concern me know.